This comprehensive guide is a wonderful resource for anyone diagnosed with cancer or at risk of developing the disease. The book provides an in-depth look at cancer, including its potential causes as well as prevention and treatment modalities. It begins with a "course" on cancer; explaining what it is, how it develops, the terminology used by oncology practitioners, and screening and early detection methods. Part two delves into treatment modalities. 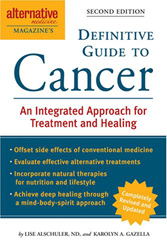 The authors review conventional "Western" treatments, including surgery, chemotherapy and radiation therapy, but also provide detailed discussions of complementary and alternative therapies ( CAM), diet, nutrition and lifestyle factors, and how to evaluate these therapies scientifically. The authors are careful to warn against "magic bullet" cures and teach the reader how to objectively evaluate therapies, providing data to support or refute the value of numerous therapies. They also warn that some therapies can interfere with conventional treatments, a fact that is often ignored by CAM therapy promoters. The book addresses the importance of certain body systems, including the immune and digestive systems, and the roles they play in cancer development and healing. The final section provides overviews of 18 different cancers and how these patients can utilize CAM therapies. The book includes numerous first person stories provided by patients and sidebars that should not be skipped, as they provide helpful, up-to-date information. The authors themselves have been touched by cancer, and it is clear that this book was an important and personal project for them. It is a comprehensive guide and may be an overwhelming read for some, but it can certainly be used as a resource with its extensive index. It would also be a great addition to any cancer center resource room.